Right of the bat, although this is my first encounter with Nvidia’s latest offering, Turning based GPU’s, I wont bother you with ray tracing this and ray tracing that, NVLink support, tensor cores and so on, you’ve probably already gone through all those features upon initial launch, so I’ll get right to the to the point. More so since I have a pretty interesting aftermarket model from Gainward. Although they don’t enjoy that much of worldwide popularity or market share as the holy trinity, the big AMG trio, they are a very prominent and have been around for as long as I can remember it. That said, it’s not that users refuse to buy them just because they don’t wanna or they’re bad or something, it’s just that they are very localized market wise, so you don’t seem them all over the world, but rather in certain region or continent. This is why you won’t see Gainward on the US market for example, but a lot of other GPU brands and manufacturers have a very similar situation, just a few of them are actually globally available. The model I have here comes from their pretty famous Phoenix series, the full name of this particular graphics card is Gainward RTX 2080 Ti Phoenix GS, with this particular one, as you can see, also being labeled as the Golden Sample, a special naming they’re using for quite a time now. Although the speed of the new GDDR6 remains the same, this means that it has a bumped up GPU core clock compared to that seen on the reference spec model, from 1545 MHz to 1650 MHz for the Core Boost. In practice, it went way above that GPU Boost 4.0 technology, boosting just a bit below 1900 MHz in games and certain benchmarks. The card is really big, like, really, really big, almost like its price tag. It takes almost three slots height wise, so be sure to have that in mind if you have other occupied expansion slots around it, while it’s over 35 centimeters long and weighing in at just above 1,3 kilograms. The outer shell looks pretty decent, it’s made out of black plastic combined with few metal-like pieces for added detail and contrast. On the back, we have this pretty subtle black brushed metal back-plate, which before all makes the graphics card more rigid, with a couple of details like the abstract drawing of a phoenix bird and gold GS sign. The cooling system on the Gainward RTX 2080 Ti Phoenix GS consists out of two big aluminum blocks interconnected with what seems to be 8 mm thick copper heat-pipes. You also have a lot of metal contact plates leaning against the rest of the cards vital parts for better heat transfer. Judging by the pictures of the reference card and taking a closer look at this one at hand, the PCB itself and other components on it, like the power design, for example, look to be of a reference design and not a custom made one, but don’t take my word for it. All of that is topped off with three fans, two bigger 90 mm ones on the outer side and 75 mm, middle one, which is also surrounded by these two arrow-like RGB strips on the top and bottom. They can be controlled using Gainward’s own software utility called Expert Tool II, where you can choose between your most common RGB lighting options and effects, as well as change the color. The amount and positioning of this lighting feel a bit underwhelming considering how imposing this graphics card is, like put a 2 in a kid-sized go-kart. For the video output selection, you’ll also get a reference setup, with three display ports, one HDMI and one USB Type-C. Opposite of those, on the back end of the card, you’ll see two 8-pin PCI-express power connectors used for powering the card. That said, under heavy load during playing, you can see it pulling anywhere from 300 – 400 Watts in total and together with the rest of the PC components. That’s actually not that much considering the scale of performance you’re getting, while under idle I saw power consumption of around 45 Watts. And now, let’s benchmark games! As for the performance, taking a look at my results, it’s all there, as expected and as seen in those initial RTX series reviews. I feel like these two resolutions which I used to test it out get the best out of this card, especially if you have a high refresh rate monitor, you will be able to take advantage of the excess frame-rates that this model is spitting out. Yes, and 4K will be doable do, no problem, but don’t expect to distance yourself from 60 FPS too far, especially if you go all in on graphical settings. Taking a ride on the overclocking boulevard, Gainward RTX 2080 Ti GS has an automatic overclocking feature available with this series through the already mentioned Gainward’s utility software, It still didn’t match my manual overclocking settings. I’ve managed to max out the memory to 2000 MHz, or 8 GHz effectively, I assume it can probably go even higher with the limiter being removed, while I pumped up the GPU Core Clock for additional 130 MHz, which resulted in a GPU boost clock of just a bit above 2000 MHz for the most time, usually hanging around that mark, even close to 2050 MHz if I cranked up the fan speed. With these changes, I’ve got additional 5-10% performance gain, depending on the title, it’s not much, but it’s something for basically nothing, other than your time spent in order to fine tune the overclock. Taking a look at the temperature, using Furmark stress test to properly load the card, you can see that the temperature limit is around 70°C and the cards BIOS will do anything to keep it that way, even if it needs to throttle the GPU clock speed way down, which can be seen here, or with bumping up the fan speed, but that’s nothing unusual. On the other hand, while playing games I was again seeing temperatures around 70°C, but with a far lower fan speed and higher, or to say normal boost clocks for this type of scenario. Last but, not the least, during idle on an open testbed Gainward RTX 2080 Ti GS GPU temperature mostly roaming just above 30°C mark, which is pretty impressive, but again, not uncommon since the fans were spinning. That got me thinking, my head scratching, why didn’t they incorporate zero RPM fans off feature when the card is in idle, especially on a count of what seems to be a very capable cooler. Thankfully, the fans are so quiet in idle that I barely heard them on an open testbed, so I doubt you’ll even notice them at all in a chassis. The lack of noise also continues when you put the card under load. If the manufacturer doesn’t calibrate the fan profile properly, having three fans can be a two-edged sword, but in this case, Gainward did it right. With having three fans, you have the ability to push more air while keeping the fan speed low, thus generating less noise, but if you get a little bit overboard, it can easily get loud and messy. When it comes to pricing, RTX series is a pretty “sensitive” topic. As this is Nvidia’s one of those “no-compromise” type or product, especially the RTX 2080 Ti series, they went all-in on the price tag. This steep pricing scheme for the Nvidia’s Turing series also came as a result of a supply pileup of the older previous generation Pascal series of graphics card which has been hyper-produced due to high demand created by the crypto-currency mining hype, so putting a really high price on it will results in reverting the customers to the older, more affordable, but still decent performing generation. 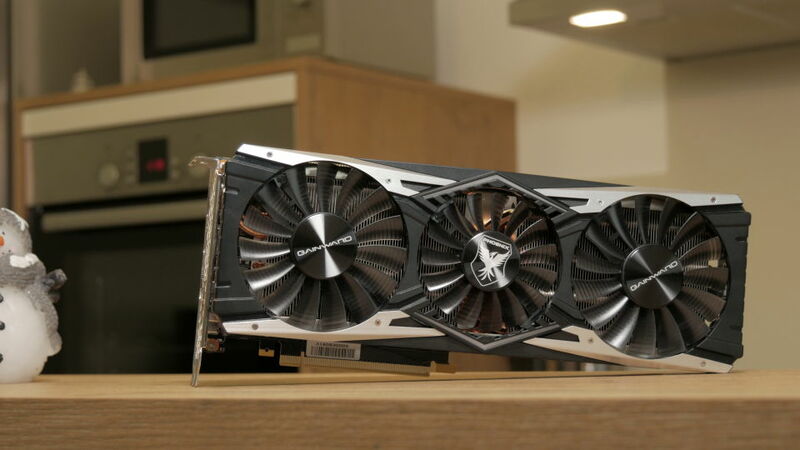 Of course, someone who really needs this type of power will not spare a dime in order to get to it, and this Gainward RTX 2080 Ti GS model could be easily put on your a short list for purchase. But, it won’t be easy for them to get into the final round, as they still have some details to polish out while having competition heavily breathing down their neck.